This is the course webpage for Professor Steven Lubar's spring 2017 class: Theory and Practice of Local History. On this site, you will find links to resources for the course at Brown and other institutions and descriptions of additional resources that will be useful to your research. Course description: The seminar examines the theory and practice of local history, evaluating examples from a variety of genres ranging through micro history to folk music, from genealogy to journalism. Work with primary documents, evidence from the built environment and visits to local historic sites and archives will enable students to evaluate sources and develop their own ideas about writing history and presenting it to a public audience. 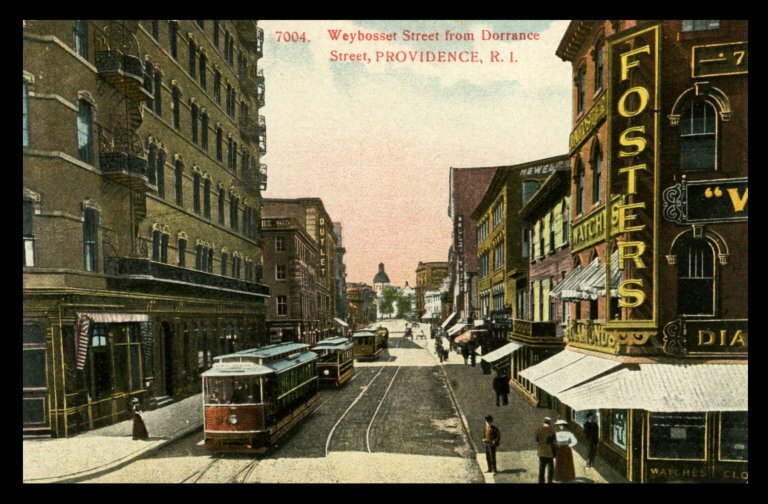 Weybosset Street from Dorrance, ca. 1900-1910. Postcard. Luna Collection.